emely popular all over the world thanks to the ease of communication they provide. We can use Viber not only to text our friends and family, but also to share photos, videos and location. All of the data is stored by the app as app cache and history on the device. Since the data is highly sensitive and personal to us, any data leak or unauthorized access to it by malicious apps can raise a privacy issue. Hence it is as good practice to clean this history and cache data timely to prevent any misuse even though you have a powerful device like iPhone. In this article, we will tell you how to delete chat history and cache data from the Viber app on your iPhone. There are some desktop apps available that allow you to do this job in a more precise manner, but in this article, we will focus on deleting Viber messages on iPhone only instead of using computer. 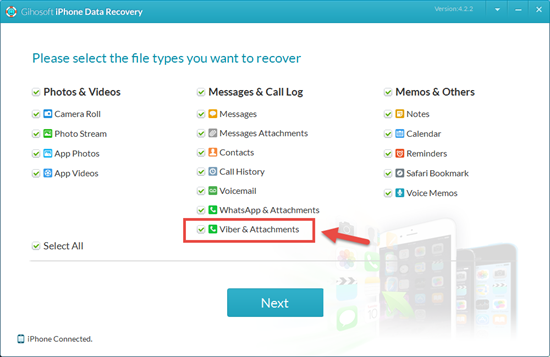 Tips: If you accidentally deleted some important messages or a whole conversation thread from Viber on iPhone, you can always use Gihosoft iPhone Data Recovery to get back the deleted Viber messages from iOS device with/without backup. Step 1: Open the Viber app on your iPhone. Step 2: Go to the Chats tab to open the complete chat lists. Step 3: Swipe left on any chat thread that you want to remove. A DELETE option will emerge on the right side of the item. Click on it and then confirm to permanently delete that chat thread, and in the process, the complete history of that conversation. You can do this for multiple chats. Or you can also select multiple chat threads and bulk delete them by clicking on the delete icon. If you want to delete all conversations in once time, you can follow these steps. After open the Viber app, tap on “More” in the bottom, and go to Settings > Call and Messages. Then tap on “Clear Message History” and confirm by click “Clear” when it asks. As a result, all your Viber messages will be removed from your iPhone. 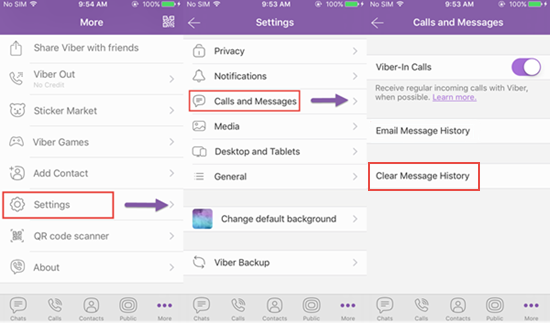 If you do not want to remove the complete conversation history from Viber, but only specific messages or media that you have shared, then you just need to follow the steps mentioned below. Open the Viber app on your iPhone. go to the Chats tab to open the chat threads list. Find the specific message or media you wan tt o delete among the chat threads. Once the message or media has been found, simply long press on it till a pop-up opens. There will be a delete option in the popup. Click on it. A new pop-up will emerge and offer you two options: “Delete for Myself” means only deleting for you while others still can access it; “Delete for Everyone” is totally clear that message from Viber and none can access anymore. If you head to “Delete for Everyone”, then the message/media will be completely deleted from the chat for all users and no history of it will remain, but this option only be available if it’s you who sent the message. If you want to completely clean all data and history of your Viber app and wipe the slate clean, then the best option is to delete the app from iPhone and then reinstall it. One best thing of uninstalling an app on iPhone is that it will completely erase all the data from the device with only one click and no need of other third-party cleaner software. 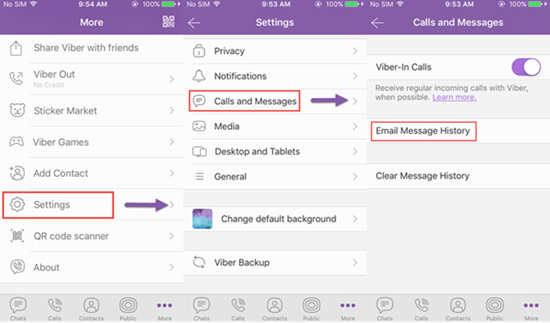 Follow the steps mentioned below to remove Viber app from iPhone. Step 1: On your Home screen, long press on the Viber app icon until it starts wiggling. Step 2: A small x icon will appear on the top left corner of the app. Click on it to delete the app completely. You can also delete the Viber app from iPhone Settings. Step 2: Go to General > iPhone Storage. Step 3: Scroll down to find the Viber app in the list and click into it. Step 4: Click on ”Delete App”. This will clean the app and its data from your iPhone. Do not click the offload app button as it will keep the app data still on the device and refill the app when you reinstall it. Once the app is deleted, you can reinstall from App Store to start afresh. Since deletion of message history clears the chats permanently, it is advisable to create a backup of your chats first, just in case some important chats get deleted accidentally. 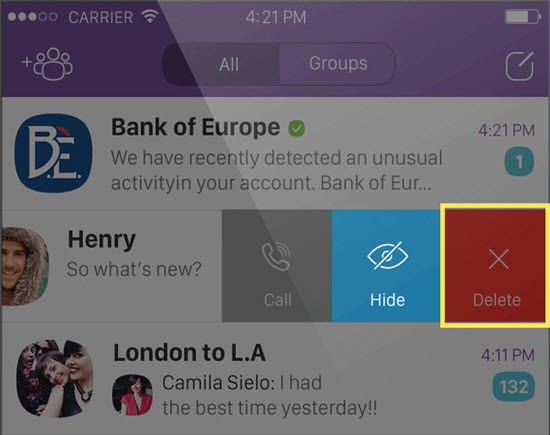 Viber app itself provides the option to save or back up your message history, which can be very helpful if you accidentally lose an important chat or message. Click on “More” options tab, and go to Settings > Account > Viber Backup. Then tap on “Back Up Now”. This will back up all your Viber data from your iPhone to iCloud. If it doesn’t work as normal, go check iPhone Settings app > Apple ID > iCloud and turn on the Viber option in the provided list. You also can email all your conversations from Viber app for backup. Step 1: Open Viber on iPhone and click on “More” tab. Step 4: Click on the “Email Message History” option. Once, you have completed the above steps, a copy of your chats will be emailed to you for future reference if required. Beside retrieving deleted Viber chats, Gihosoft iPhone Data Recovery can also be used as the extract tool of Viber messages for backup. Just follow these steps below to save your Viber conversations to computer. Install and run Gihosoft iPhone Data Recovery on computer and connect your iPhone. Select “Viber & Attachments” and start scanning. Click on “Recover” to export all Viber messages from your iPhone and save them on PC. Also, one of the easiest ways to back up your Viber data on iPhone is to use iTunes or iCloud, or both. These two are the best way to back up data from iPhone, and they are easy to operate. Sync with iTunes: Open iTunes on computer and connect your iPhone, then click on File on the menu > Devices > Back Up to start the backup process. Sync with iCloud: Go to iPhone Settings > Apple ID > iCloud > iCloud Backup, toggle it on if needed, and click on “Back Up Now” to start syncing. Also remember to turn on “Viber” option in the iCloud setting page. Every day, we all use instant messaging apps to share a lot of personal data with our friends and family. This data, without our knowledge, keep getting stored on our devices. This can be a privacy concern for us as the data can be misused by the app itself or even other apps. Hence we should make sure that we clean this data from time to time to ensure our privacy is not affected. 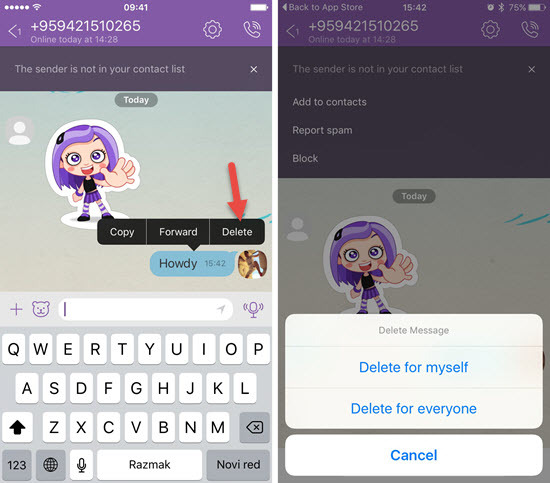 We hope the methods we have shared, about cleaning Viber message history on iPhone, in this post will be helpful to you. If you have any question or suggestion, welcome to contact with us by commenting down.